A recipe that’s been a decade in the making, tried and tested by my own mother, this Dominican eggnog will become your go to eggnog recipe during the holiday season! Continuing with the holiday recipes, this one comes all the way from the Caribbean island of the Dominican Republic, where I was born and raised for the first 24 years of my life. An island where winter is a fairytale, one we Dominicans only experience when we travel to places up north. But even without winter, we celebrate the holidays in full force – because who needs a “white Christmas” when you can go to the beach and suntan on Christmas morning?! Today’s recipe for Dominican Eggnog is thanks to my mom (did you see her recipe for Dominican Cake?!) – she’s been my inspiration for all thing foods. Whether we baked together while I was growing up or we just sat over a cup of coffee talking about life, our lives have been surrounded by food moments. 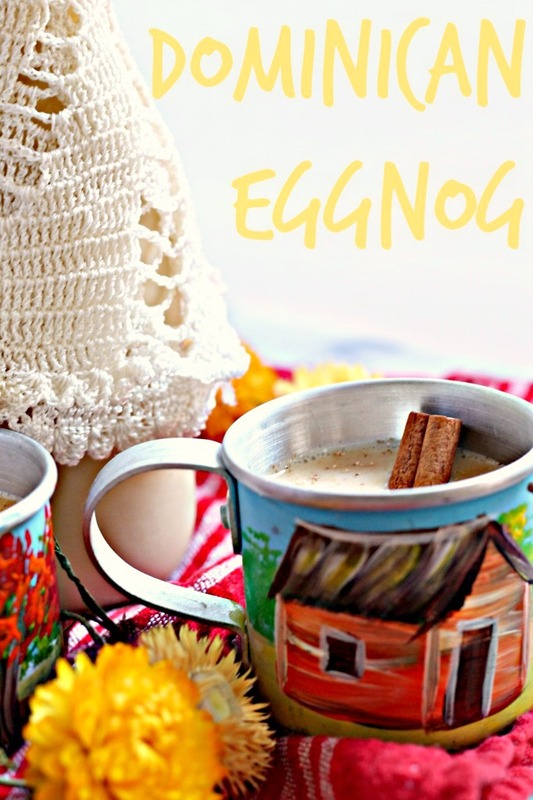 This eggnog was made only during the holiday season, so it was always a special treat. It’s not too boozy, just boozy enough but you can definitely make it without the booze for a non-alcoholic version. It only gets better with age, so you’re in for a treat for the rest of December! This Dominican Eggnog recipe comes from my ever so talented Mother. She's been making this recipe for years and only makes it during the holiday season - so it's extra special! Place the sugar, water, and cinnamon stick in a small saucepan and cook until sugar is completely dissolved and a syrup forms. Using a stand mixer or hand mixer, place egg yolks in bowl with spiced rum and vanilla extract. Whisk for 5 minutes until frothy. Drizzle in quickly the hot sugar syrup (remove the cinnamon stick before adding) and whisk on medium high for another 5 minutes. Add the condensed and evaporated milk, as well as the brandy. Whisk until incorporated. Strain into a bowl and refrigerate until chilled. Transfer to an airtight glass bottle and serve. Keeps for up to a month in the refrigerator. This looks like the perfect winter warm-up! !